Wear your wild side proudly with this bold and exotic satchel tote bag by your side. 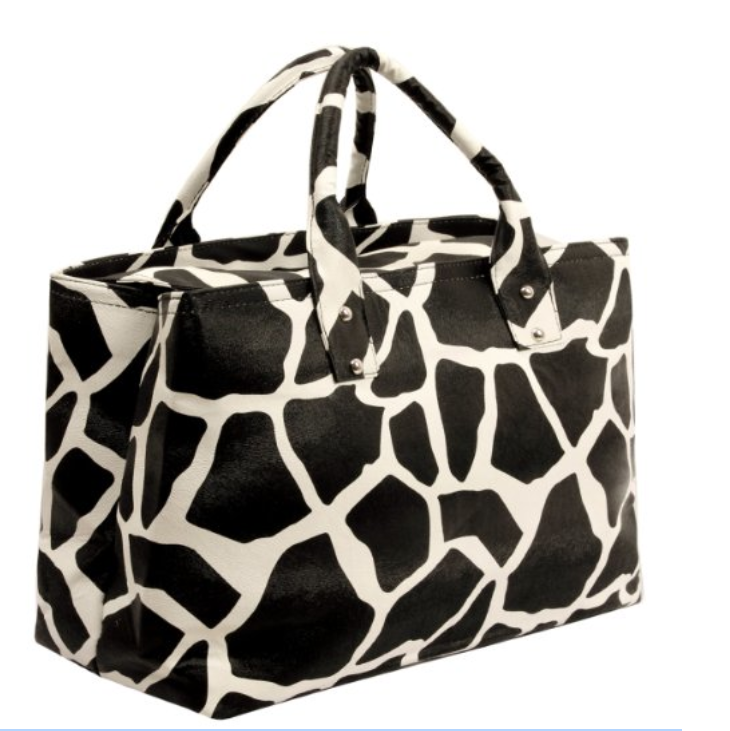 The bizarre giraffe animal print that graces the exterior of this fashion top double handle handbag is perfectly paired with a vivid black-and-white motif that adds extra “oomph” to this wild design. Just grab hold of the 2 dependable top handles to take this wild party on the road. Beyond the wonderfully wild exterior and beneath the snap-secured top flap, this shopping bag features an interior with fabric lining and plenty of space for all daily essentials, 1 pouch-style zippered partition to divide 2 main compartment plus 2 pocket-style organizers, 1 zippered pouch and 1 exterior zipper pocket to help keep small items from getting lost in the shuffle. 4 silver-tone studs on the bottom of this hobo bag that help prevent slipping when the handbag purse is set down. Keep this bowler bag close at hand to bring daring style along wherever you go. Pair this fabulous office tote with anything from casual jeans to flirty skirts to add some exotic flair to any look. Bold black-and-white giraffe animal print women satchel with silver-tone hardware. Top flap unsnaps and opens to reveal 2 spacious interiors divided by 1 pouch-style zippered partition plus 2 pocket-style organizers, 1 zippered pouch and 1 exterior zipper pocket. Can be carried by 2 sturdy top handles. Approximate Dimensions: Exterior – 10.5″ H X 16.5″ W X 6.25″ D; Each compartment Interior – 9.5″ H X 15.5″ W X 3″ D; Handle – 5″ drop.